There is a great deal of new material to bring to the table based on this story. Indeed, this is a special moment as with the release of this episode’s companion we surpass 100 items of content released to the DCC community from Audios to NPCs, Monsters to Weapons, and Classes to Patrons. In honor of this landmark, our one hundred and first item is our first adventure penned by David Baity! Below is a list, by category and author, of what has been added to the Dark Acquisitions page by the Keepers of Mysteries, based on this show. Further contributions from friends of the library will also be found there as they arrive. If I may pimp a freinds Actual Play Podcast (CoC d20), Cthulhu & Friends. They also have readings of some short stories. 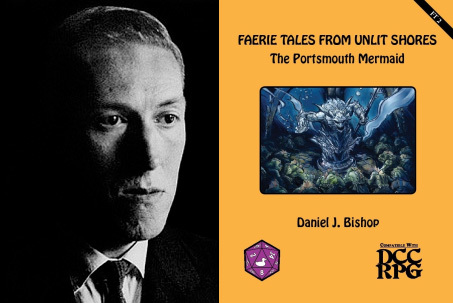 “Shadow Over Innsmouth” is one, although it’s in prts and I think they have one more to do for that. Hey there gang, finally had a chance to drop you a line and tell you how much I’ve been enjoying the podcast. always informative, entertaining and chock full of ideas. David’s Spotify playlists are a great addition to some my games. I hadn’t clued in to the Companions until this last episode, but I’ll be downloading them all tonight for sure.If you need any art for the upcoming Compendium, I can donate some to the cause if my schedule allows it -David’s got me pretty busy these days! 😉 Keep up the great work lady and gents!